NDCL students reside in Lake, Geauga, Cuyahoga, and Ashtabula Counties. Therefore, we understand the importance of safe, convenient transportation options for our families. Public School districts that provide round trip transportation at no additional cost to parents currently include: Berkshire, Cardinal, Chardon, Kenston, Kirtland, Mayfield, Mentor, Newbury, Riverside, West Geauga, and Willoughby-Eastlake. Click here to learn more about these 11 public school districts that provide transportation to their residents. As a service to our families, NDCL offers bus transportation for students who live in neighborhoods where busing is not provided by the local public school district. NDCL-provided bus transportation will serve those locations in Lake, Cuyahoga, and Geauga counties where the expressed need is greatest. 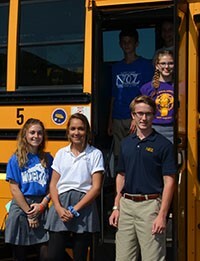 To learn more about NDCL-provided bus transportation, click here. Athletics, performing arts, and clubs are an important part of any student’s high school experience. The activity bus leaves NDCL at 6:20 p.m. each evening throughout the school year and is a convenient way for students who participate in after school activities to get home. Click here to view our 2018-2019 activity bus route. Parents can drive their children to school. Students, if driving age with a license, can drive. This privilege is open to students on any grade level. Families in the same geographic area can always arrange a weekly car pool schedule. If you are interested in carpooling, click here to place yourself on the carpool registry. To view our carpool registry click here.